Ernest Julius Erickson's "Deer Hunt Diary"
My uncle Ernest Julius Erickson and my grandfather Frank Severin Erickson went on a deer hunting trip to Mount Baldy, Oregon starting on September 18th, 1917.
life for nine days in the wilderness of Oregon. 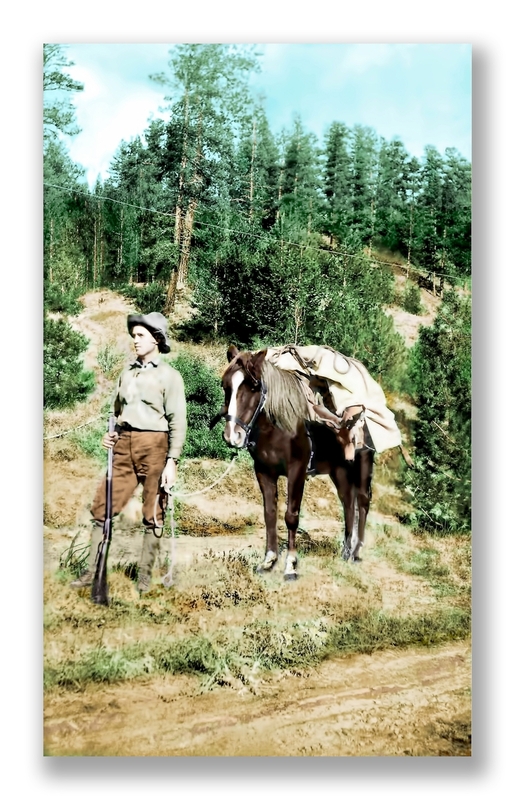 Ernest Julius wrote daily diary entries of their days and nights along the trails of Oregon. © Mark Erickson 2017 All rights reserved. This copyrighted material may not be republished without permission. 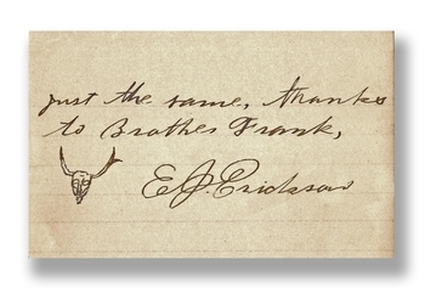 My great uncle Ernest Julius Erickson wrote in his diary starting in September 18th and continued on till the 26th of 1917. He and my grandfather Frank Severin Erickson were on a deer hunting trip to Oregon from the Dakotas. Frank and I started out from Baker, Oregon at 8:35 in the morning and arrived at Sumpter at 10:30am. Got a car from there to Granite, Oregon for $2.00, a price arrived at this given place. 12:30pm had dinner and then started out for the mountains. Mount Baldy is our destination. I have our bedding which consists of a lean-to tent, 6 feet by 14 feet, one woolen blanket bundle, one small quilt and two coats in case of cold weather. And have my rifle, a Winchester .25-35. Brother’s (Frank) outfit is a knapsack with our grubstake and our loads weighted about 50 or 60 lbs and a sack of rifles and all. Frank has a .250-3000 (Savage rifle). Arrived at the foot of the mountain around 5 o'clock which was perfectly timed as we are not used to traveling with such a heavy load and not used to mountain climbing. had our supper and made camp, went to bed at 7 o'clock and that is all for the first day. Went out towards the mountain today and found out that we were not camped at the foot by any means. as it took us 4 hours to get anywhere near the mountain. there is lots of Deer tracks here, but it is too hard to do anything. it is too heavy timbered. we finally surprised one early in the morning, but never got sight of him. all we saw were his tracks, we split-up at the foot of Baldy and were to be back in camp by 4 o'clock tonight, but I got in at 5:10pm, after I had walked by camp about a mile. Frank got in at 5:40pm, just as tired as I am and with the same kind of luck. Was planning to get back to the same place where we parted yesterday at 10 o’clock, but we arrived there at 12:30pm. these places are pretty hard to find as they all look strange even though we were there yesterday. crossed yesterday’s track only once going out and arrived just before we got to camp tonight. got here with the same kind of luck as yesterday. saw some grouse today, but did not get a shot at them. it is about the darkest place I have seen, you can’t hear a bird greet the sun in the morning and Frank and I are not very good singers or we would do our own singing. well we are both pretty tired so will smoke our pipes a little longer and roll in, had some supper tonight so we are feeling pretty good. Left our camp on Rock Creek this morning without seeing a Deer. got into Granite at 1:00 o'clock and had dinner and got some more grub, then started out for the country north of Granite that is supposed to be the winter feeding grounds for Deer. they are known to stay there all summer. arrived at Squaw Creek and went up the Creek about a mile from Granite River and pitched our canvas. pretty tired after walking 15 miles with our packs of 50 - 60 pounds each, but after having supper we are feeling first rate again. I like this country better than the Baldy country, far more open so we have a better chance to get a Deer. rolled in at 7 o'clock. Stayed in bed late this morning as it rained all last night and feel rather lazy. we started out at 9 o'clock and took the ridge along Granite Creek for about 2 miles, circled to the east where Frank and I parted. Frank taking the opposite side of the gulch. I did not see him or hear anything until noon when I found some new signs of Deer, the first I had seen all afternoon. a little while later I heard a shot not very far to my left, at least I thought it was and a few minutes later I heard Frank whistle. I went back to try and find him and to find out what he got, but the further I went the further the whistle sounded. so I decided that I was on the wrong track and came back to where I first had seen the Deer tracks. Then it began to rain again so I sat down under a tree till the hardest rain was over and then came back to camp at 2:35. I started to cook as I was pretty hungry and thought Frank would be the same. we were to meet back at camp at 4pm, but here he came in at 3:20 all smiles and blood on his clothes. so I knew just what to expect, he had bagged a nice Buck of about 150 lbs. dressed. after supper which did not take so very long, we started out to bring in the Deer. Frank got him about a mile from camp and behind me. that was why I could not find where he was. Well we found the buck all right, but Frank had forgotten his knife where he had dressed him, so we had to go up there. he had carried the deer down about 3/4 of a mile which was no easy thing to do, we found the knife and then started back with the Deer on a pole between us. I sure can say I was some tired before I got home and so was brother. got here and that was the end of a perfect day if ever there was one. so we sat down by our little camp and made some tea and cakes and then it had begun to rain again so we went to bed feeling that life is worth living after all. Have not been out to day as it rained all last night and today so there has not been anything doing today except eat and watch it rain. had some healthy stew and it tasted mighty fine so there is about all there is to sunday. Praying for another buck. still raining. We took in more territory than we expected today. we got into the roughest country I have ever seen and we did not know just where we were except that we knew we were in Oregon somewheres. so we just kept on a traveling. had a can of pork and beans at noon so we did not get so very hungry, but our stomachs felt pretty darned empty. well we struck up a stream after some hours travel, that is after 8 hours, and we followed that down for some time, but had to get back on the hills again so we could see some place. we got on the hill alright, but we did not know the country then, so we kept on going towards the sun thinking that we were some wheres east of our camp and after a little while we struck onto a higher stream yet. well there was an old saw mill on that stream,but we did not know the place, so we hunted around there. found a big road and Frank thought that he had seen the same road somewhere before, but it was so darned big that I did not think that they could up and moved it. You see I was completely turned around and did not know the bearings to save my soul. Well Frank took the lead the way up that road and up it sure went. I did not think that we'd ever get to the top, but after our knees seemed to be almost all in from climbing that hill we got to the top and believe me I was sure some tired. but we was not home yet and thought sure we would have to sleep out that night, but we kept on walking and we finaly got to a place in the road where we could see a hill that we had went over that morning. so we hit out for that and that got us to the creek that we was camped on. we were then about 2 miles from our camp and made ourselves some supper and then we were glad to get in between our blankets. This morning when we went out we got onto some tracks not over a 1/4 of a mile from camp, but we did not follow them and took another direction. did not even see any more tracks so we went to Mr Andersons, a sheep rancher and got a horse to pack our outfit and DEER to town. We then took some pictures of camp and departed. got to Granite about 3:30 and fed the horse and then Frank took it back to Mr Anderson. he got back at 7 o'clock so our hunting is over with for this trip. Well we sure slept pretty sound last night as we had not seen a soft bed since we got out here. took the stage into Sumpter which cost us $5.00 and then we had to wait till 2:20 before we got to our horses and came in with the Game Warden. got in to Baker at 4:30 and that is the end of my first Deer hunt and I am well satisfied with the hunt although I did not get to see a live one, but we got one: Just the same, thanks to Brother Frank.